Expertly researched and created in partnership with local land management agencies, National Geographic's Trails Illustrated map of Grand Teton National Park provides an unparalleled tool for exploring this magnificent region. 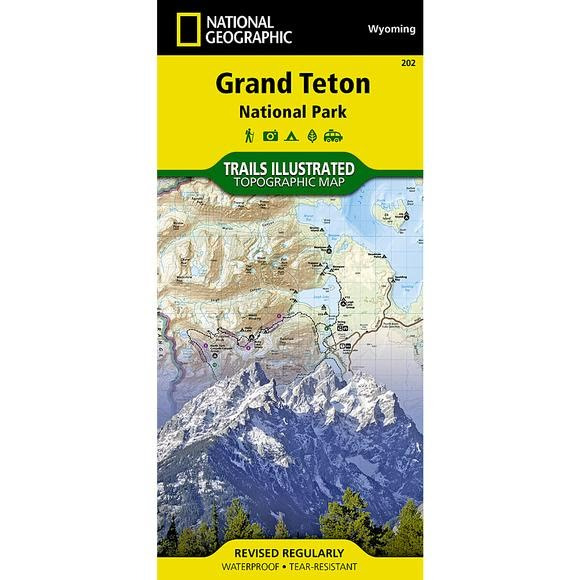 Expertly researched and created in partnership with local land management agencies, National Geographic&apos;s Trails Illustrated map of Grand Teton National Park provides an unparalleled tool for exploring this magnificent region. This map offers unmatched detail of the entire park and features key areas of interest including Jackson Hole, Jackson Lake, Colter Bay Village, Jenny Lake, Phelps Lake, Teton Crest Trail, Bridger-Teton National Forest, Caribou-Targhee National Forest, Gros Ventre Wilderness, Jedediah Smith Wilderness, and John D. Rockefeller Jr. Memorial Parkway. With almost 250 miles of mapped trails in some of the most breathtaking scenery in the entire country, the Grand Teton National Park map can guide you off the beaten path and back again. The trails are clearly marked to help with navigation for backcountry explorers. Suggested backpacking trips, weather and safety tips, and information about other recreation activities are included to help guide you in enjoying all the park has to offer. The map base includes contour lines and elevations for summits, passes and major lakes. The bathymetry of Jackson Lake is shown with both contours and hill shading. Some of the many recreation features include: campgrounds, trailheads, parking lots, scenic overlooks, interpretive trails, and backcountry camping zones. Other features found on this map include: Grand Teton, Grand Teton National Park, Gros Ventre River, Gros Ventre Wilderness, Jackson Hole, Jedediah Smith Wilderness, Jenny Lake, John D. Rockefeller, Jr. Memorial Parkway, Mount Moran, Rendezvous Mountain, Targhee National Forest, Teton National Forest, Teton Pass, Teton Range, Teton Wilderness.